Each year since we have owned the camper, my wife and I take a trip in late April. We call it our “shake down” trip. We usually camp close to home, and also close to stores that may have what we need should we run into trouble. 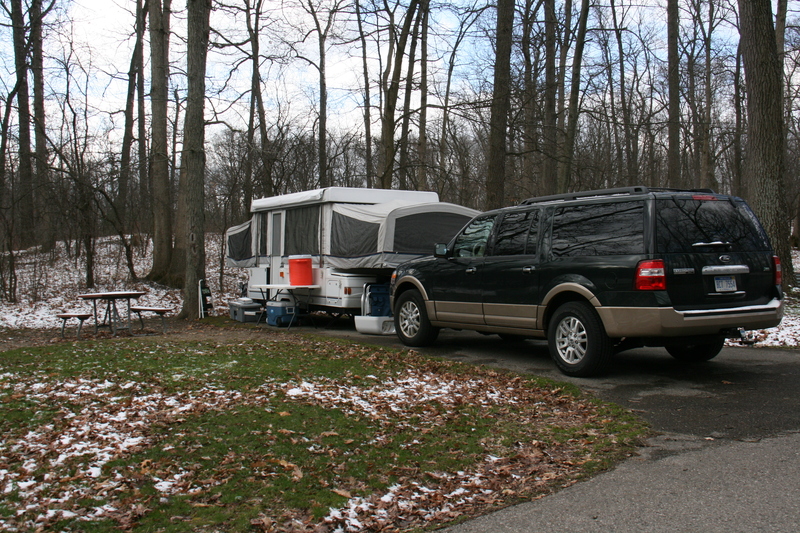 We have uncovered winter issues with the camper, and have learned how to work the various systems in years past. Our snowy Saturday morning surprise. This year our shake down trip was to W. J. Hayes State Park in the Irish Hills of Michigan. In Michigan, weather can be very sketchy in April and May, this trip proved that point. We arrived in blustery conditions, woke on Saturday to a covering of snow, and endured an overnight low of 24 degrees Saturday night. We also managed to drain both of our propane tanks, and popped a circuit breaker making breakfast on Sunday. I’d say we got the kinks out for this year. Since it was so cold out, we ended up playing indoor games at the table in the camper. Since our first trip we have always kept a supply of fun games to play while camping. Some have worked better than others. In this post I am going to tell you about our three current favorites. Scrabble. My wife and I have been playing Scrabble for all of our 30 years together. We presently own 5 different sets, and three Scrabble Dictionaries. In the camper we prefer the version in the picture at the left. It is a compact set, using the classic board. The racks, tiles and score sheets all fit into drawers under the board. The board has rollers so it is easy to rotate on the smaller table in the camper. 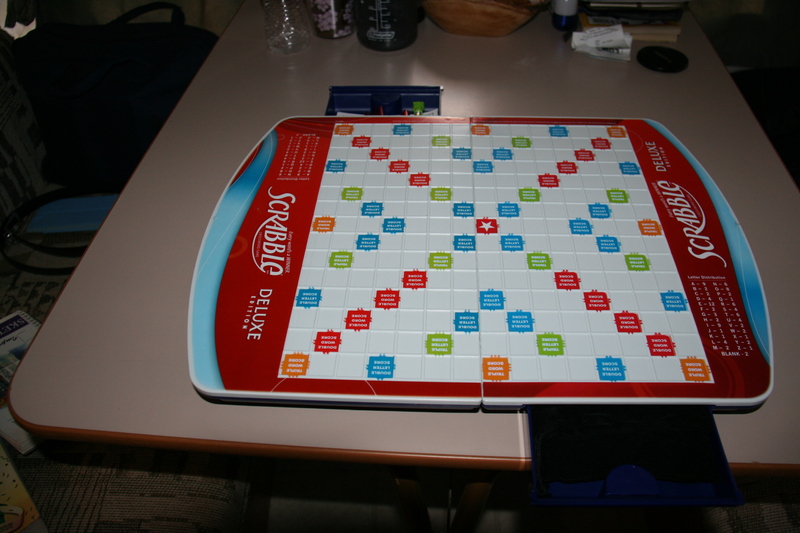 If you are a scrabble player, this is the version we recommend for camping. If you like ordering from Amazon.com, you can find Scrabble Deluxe on their site for about $35. For the dedicated camper who is also a dedicated Scrabble player, this is well worth the investment. Yam Slam. If you have never heard of this game, think Yahtzee without a scoring pad. It is a fast moving game where you roll 5 dice and try to come up with combinations similar to those in Yahtzee. But, instead of keeping score on paper, you earn chips. There are a limited number of chips in the set, so once about 28 turns have been taken (combined for all players), the game is over. You can get more information on Pocket Yam Slam from the Blue Orange Games website. My wife originally found this in a full-size version at an educational games store. We bought it for a friend’s daughter as a birthday present. Last year we found the pocket version in a store while vacationing in Northern Michigan, and it is now a staple of rainy day, or cold day activities. 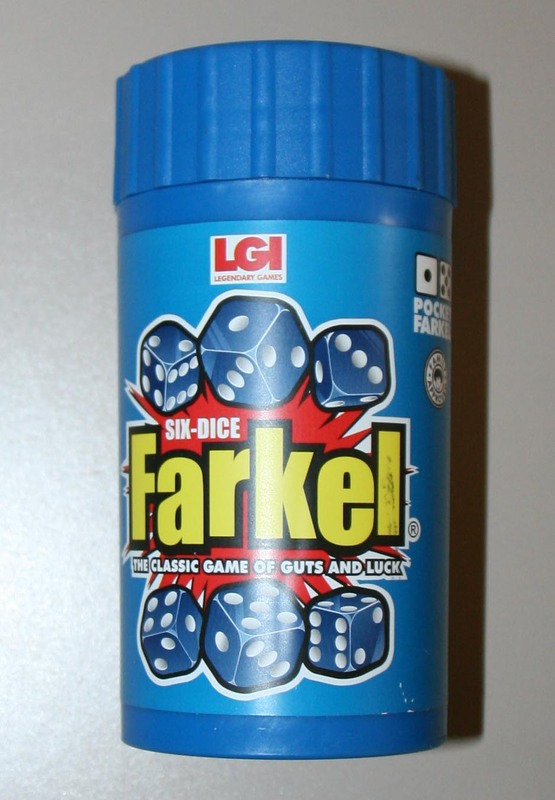 Farkel. This is another dice game. It uses 6 dice, and also uses a score pad. 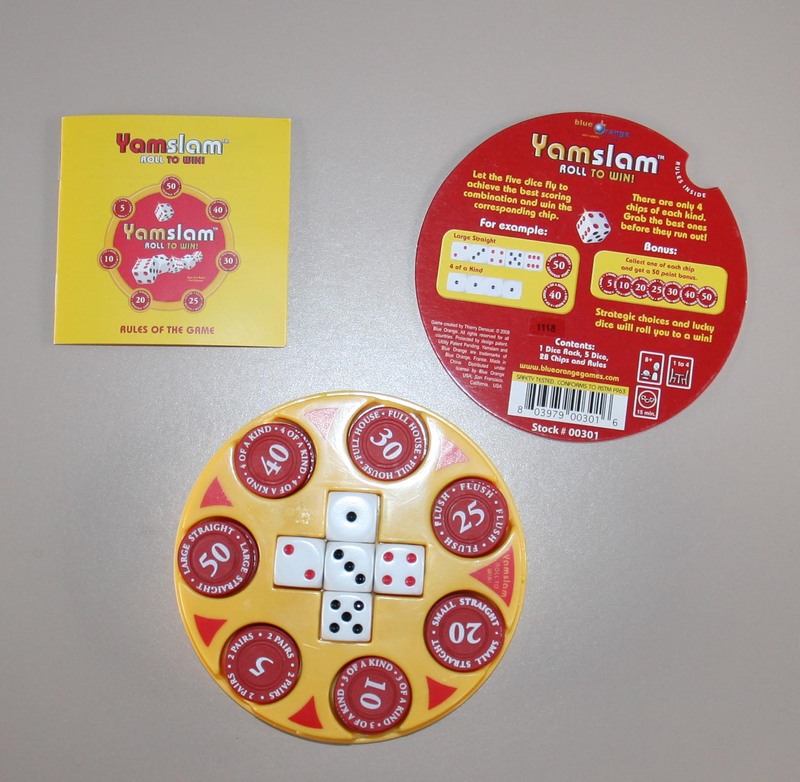 You roll for combinations, as in Yam Slam, but the scoring is very different, and much higher. The great thing about this game is how self-contained it is. The blue cylinder comes with the dice, instructions and scoring pads. We added a couple of golf pencils, and we were on our way. Because it is small and light weight, it could even be packed along on a backpacking trip. Six Dice Pocket Farkel is made by Legendary Games Inc. In my next post I am going to talk about some of the sites to see around W. J. Hayes State park. This entry was posted in Camping, Travel and Outdoors and tagged blue orange games, bobby-c, camping, cold day activities, farkel, legendary games inc., michigan camping, rainy day activities, scrabble, shake down trip, W. J. Hayes State Park, yam slam. Bookmark the permalink.